Born in Kansas City, Ken Edwards graduated from the K.C. Fine Arts Institute. 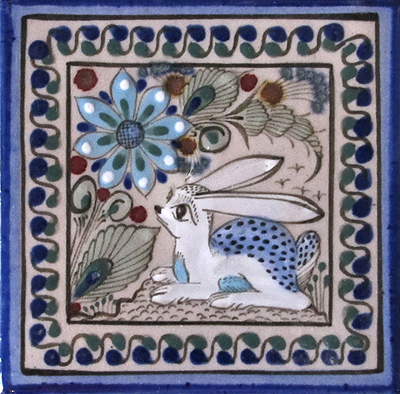 He then studied in the Far East where he mastered the use of high-fired glazes and special clays. In the late 1950’s, he moved to Guadalajara, & began experimenting with many types of pottery, collaborating with some of the ceramicists who are, like himself, today considered “National Treasures of Mexico”. He was also a founding creator and director of production for the pottery line “El Palomar”, with Mr. Fred Meiers who now owns the name “El Palomar”. In particular, his friendship & work with the late Jorge Wilmot is a basis for what we know today as “Ceramica Ken Edwards”. Tonalá has a reputation for producing world-class pottery, with craftsmanship handed down through numerous artisan family lines, Ceramica Ken Edwards is truly one of the leaders in this most special of Mexican cities. The ceramics of Ken Edwards, with unique designs and shapes of the highest quality and artistic value, has always been characterized by the freedom of expression which it’s painters and throwers manifest in each piece. The decorations are based on 400 year old Nahua designs from the area around Tonalá, Jalisco. Ken adapted the animistic imagery, preserving the individual elements into a ‘play-book’ for his painters to combine on the pieces, as their talent inspires them to. The painters take pride in signing each piece with the KE trademark, as well as their own personal symbol, or “chop mark”, a tradition Ken brought from China. The current line consists of 3 motifs, “Tradicional”, “Coleccion” and “Monarca”. The exquisite variety of forms and decoration has brought this line a wide & loyal following in the international market. In tones of blues, golds and greens, the dinnerware has an amazing array of plates, bowls, cups and serving pieces especiallydesigned for the perfect presentation. Lovely co-ordinating home decor pieces are incorporated into the collections. There are 6” & 4” tiles, flower pots & vases, door pulls, trays, boxes, cannisters, lamps and over 100 different animal figurines. He then steps further out with his collection called “Bohemian” in a wider range of colors with menageries of 3-D flora & fauna emerging from the surfaces of these enchanting pieces. 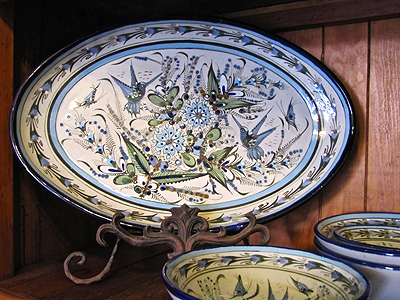 Stoneware is a type of pottery using special clays fired at very high temperatures. This makes it very hard and durable. All KE stoneware is certified Lead Free and is dishwasher & microwave safe. The Ken Edwards factory is still in Tonalá, where his young family members are at the helm. Ken himself has moved to the mountains of northern Guatemala, in San Antonio Palopó, where he has been teaching the locals to make stoneware using traditional Maya decorations… with a twist.